Chain Conveyors - Remcon Equipment, Inc. - Remcon Equipment, Inc.
Chain can be used as a means of conveying products in many different ways. There are almost endless styles of chains that are made specifically for use on conveyors, and the possibilities for chain attachments are also practically unlimited. Chain is easy to drive using the appropriately sized sprocket, can be repaired by replacing individual links, and is strong and hard to damage. 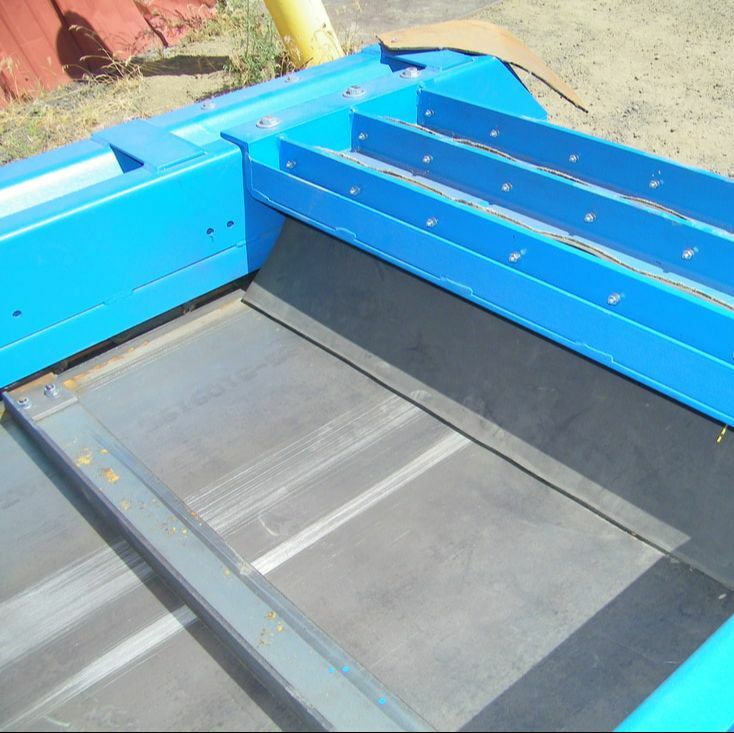 Below are the most common types of chain conveyors that are used in the recycling and material handling industries. This is the most basic type of chain belt. The chain lies flat on its side as it slides on tracks made of angle iron with UHMW wear surfaces, to reduce friction. The chain belt is guided around both ends of conveyor on sprockets. The sprockets at the discharge end of the conveyor grab the chain as the shaft and sprockets are turned by a motor with a reducer. This type of belt is similar to a Drag Chain belt, except that the chain has steel rollers built into each link which roll on rail tracks instead of slide. This reduces the drag of the belt as it travels along the conveyor. ​This type of belt is the same as the Roller Chain with Rubber Belt, except steel panels are substituted for the rubber belting. Remcon offers a variety of steel belt options; contact us to discuss which configuration would work best for your needs. Dual-strand drag chain conveyor for feeding catalytic converters onto a sorting line. Drag Chain Conveyor with Steel Flights (Beltless) for Conveying Metal, etc. This style of drag chain conveyor is simple and robust in that there is no actual belt surface to become punctured or bent. It is similar to a single strand drag chain conveyor, but employs two parallel strands of chain connected with a steel cross-member. The cross member carries the material along as it slides on top of a flat steel surface either horizontally or uphill. 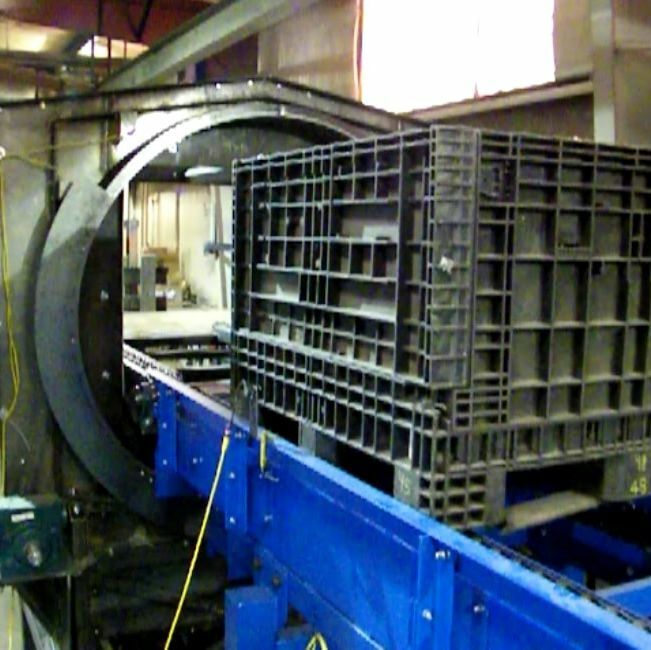 A dual-strand chain conveyor designed to convey standard sized tote bins of crushed glass into a bin dumper. A uniformly shaped object such as a bin or pallet sits on two strands of chain. Heavy-duty chain rides on its edge on a UHMW wear surface as each strand loops around the conveyor, with sprockets at each end. The two strands of chain are not connected to each other, but are pulled along simultaneously by a motor connected to the drive shaft with sprockets mounted to it at the discharge end of the conveyor. The bin or pallet is pulled along the conveyor as it rides on top of the chains. 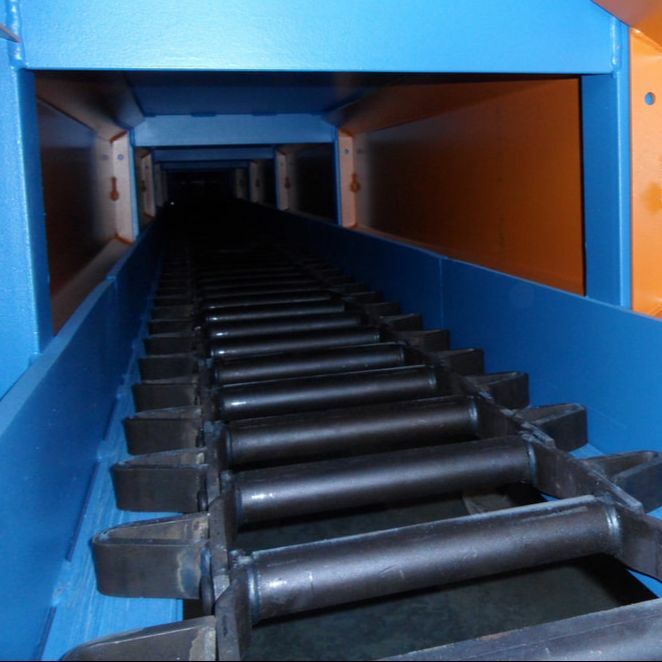 These conveyors can be built in many different styles, and can be arranged and set up with sensors to allow automatic staging, conveying, dumping, raising, and lowering of bins to different locations in a plant. This is the most simple form of drag chain conveyor, in that a single, wide strand of chain slides along a flat wear surface, dragging along with it loose material that is fed into the conveyor. Depending on how these conveyors are designed, the chain can move only the material that sits inside the links of the chain, or the material that sits both inside and on top of the chain (sometimes called "En-Mass Conveying"). These conveyors often employ some type of paddle or wing attachment to help move the material along, but they are not always required, depending on the application.